Website with drawing tips and tutorials! Today I'm doing something big. 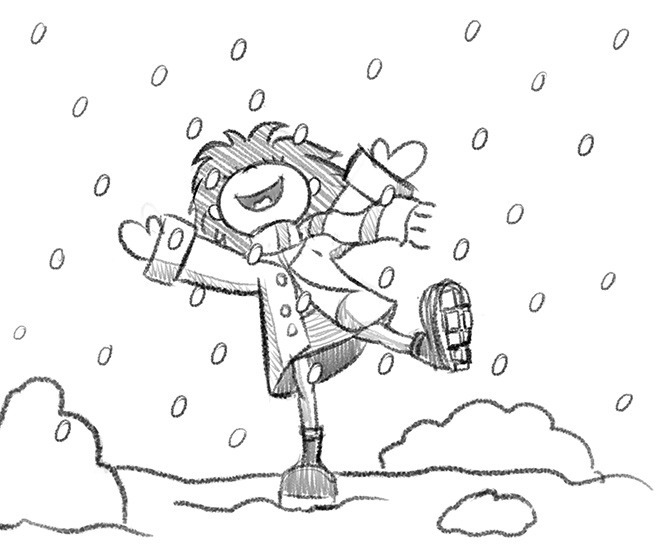 I'm oficially announcing the opening of my new website: Little Drawing Tips (little-drawing-tips.tumblr.com)! VIDEO of my new picture! New video and grand opening of my new blog! Hi guys! So I decided to create a new blog, dedicated to disney-like style, disney characters and famous people/protagonists drawn in a disney way. Just for fun! Finally new video process is up! But enough of that. Today I realised it'll soon be NINE years since I joined dA. Not only do I feel old ( ), but somehow... proud? Well, I didn't accomplish a lot, especially considering my goals from that time (ya know, being extremely popular, likable, having lots of popular friends, etc - the regular teenage dreams xD), but being aware that I've been part of the biggest art community for almost a decade is... very pleasing. I sometimes like to look back at my beginnings and see how I and the site changed. And I somehow miss those times when everything was new and I was just at the start of my online artistic journey. During that journey I discovered hundreds of amazing artists who gave me inspiration and motivation to improve. I was a gallery moderator, I organised contests, events, gave first Daily Deviations (when they were still a huge exposure) to people who later evolved into fantastic artists (with Charlie-Bowater or anikakinka among them, whose careers I was lucky to observe almost from the beginning), etc. I got five Daily Deviations myself and got chances to appear on the front page three times or so. I've also had wonderful watchers who've been there with me for most of the time, some for almost as many years as I, which is even more amazing. Nowadays hardly anyone visits my page anymore, almost half of my watchers is inactive/left dA, I have no time to keep my profile updated and no new stuff to submit anyway, so no wonder I'm being forgotten. It doesn't bother me that much anymore, but remembering how obsessed I used to be with popularity makes me a little sad. xD And you know what? I wish I could start anew with a fresh account, ereasing my whole dA history from the web. To again have that feeling of a start and refreshed motivation. I know I can create a new account, but there's no point in reuploading my pictures somewhere else if they're already everywhere in internet under my current nickname. And I don't want to get rid of 'anako' either. 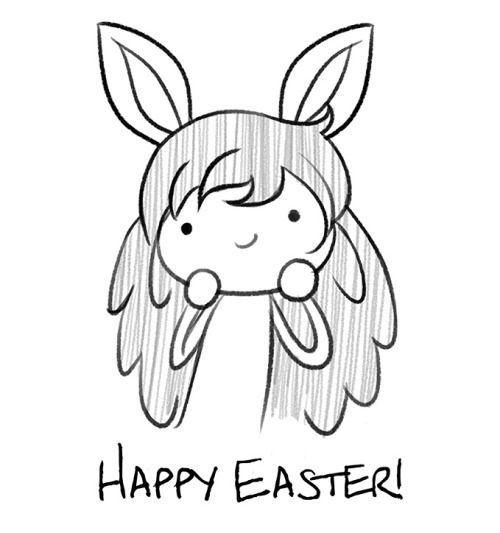 So I'll just sitck to my old account, but for now... will clear it. You can still find my pictures in my portfolio or tumblr. But I'll put my whole dA on hiatus until I'm ready and free to create for myself again. I'm planning to finish my current jobs until the start of July, so it's not that long from now. Either way... I still don't know if I bring the old deviations back. I'm kind of sick of looking at them when I'm not able to draw in my style and improve. Bleh. Thank you for still being with me, sweeties. FREE SHIPPING on prints from my newly-opened shop! Only to days left until the end of promotion! Hello guys! I finally opened my shop on Society6 And today a special offer has started, which is free shipping worldwide until Nvember 17 (Midnight Pacific Time). 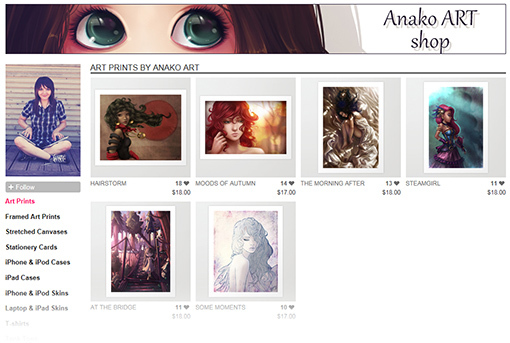 All you need to do is go to the shop through this special link: society6.com/anako/prints?prom… ! Hey guys You probably noticed that I've been very quiet for a while... a few months even. That's surely some time, so I better give you some explanation. WANT TO PARTICIPATE AND HAVE YOUR WORK CRITIQUED OR QUESTIONS ANSWERED? CLICK HERE! Hello everyone! Welcome to the very first Issue of Anako's Blunt Critique Department! Before we start I'd like to send some huge thanks to everyone who participated and sent their works for critique. I was really surprised by your enthusiasm towards improving! That's so awesome! As I had suspected, it wasn't easy to choose one picture for the Main Critique. Each one had so much potential that I eventually decided to additionally pick three more works for something I'll call Minicrits. So now in every A.B.C.D. journal there will be one Critique of the Issue and three Minicrits - to cover as much as possible. If your picture wasn't chosen - please don't be sad! As I had mentioned before, not every artwork is suitbale for the paintover critique. It also might happen that it just doesn't have enough things to improve to show it as an example But enough of the formalities, let the fun begin! Hi, thanks for sending your picture! First of all, I must say that you did a great job with using the narrow color pallete. Not only did it create a nice, slightly mysterious mood, but it also helped the character to merge with the background immediately, which is extremely important and very easy to miss if you're using too many different colors. Also, big plus for keeping in mind atmospheric perspectice on the background, making it less saturated and less detailed due to the distance. Now time for some grumbling. The first thing that strikes here is the composition. You placed the character in the center, which can be ok, but you cut her hands so bestially, that I need to point it out in bold: never ever cut any extremities or other limbs close to their bending points. Or avoid cutting them at all, because it's difficult to keep it look good and natural when such narrow and long ungrouped elements are cropped. While the character is obviously the main subject here, you could give her more space (especially above) and lenghten the canvas to the left (for example). It would make the composition more interesting. Very nice try with fixing the main light source, but you made one very common mistake - you set different lighting for the character and different on the background! Do you see how the castle is lit? indeed, from the right, while the sun shines from the left. Keep in mind minor details like this one. As for the shading itself - I see that you tried to keep the form of the shapes, but there's too little contrast to make it visible. The best method to learn or check your contrasts is to make picture black & white. As you see, I totally exaggerated the lights and shadows in this picture, but if you compare them both in b&w with squeezed eyes, you'll see that high contrasts make it more alive and interesting. I happily noticed that you applied translucence to the hair, when the light adds more saturated color to it, though you could make it stronger. Also remember to treat hair not as single wisps, but more like whole big shapes. It's more important to keep their solidness than the texture. I noticed that you painted the hair above the lineart (which is great), but the rest of the picture is colored below it. Try to be consistent with the coloring style to avoid chaos. And lastly, the anatomy. While you managed to draw and paint the eyes very nicely, remembering that they're balls, the other parts of the face need more referencing and work. The lips look out of place and the girl is missing a chin - study the shape of human head under different angles to see how its elements are placed. Overall, the picture is very pleasant to look at, and definitely emphasizes the character's personality. If you try to be braver with your coloring and remember to avoid simple mistakes, you'll get much better in no time! Want your work to be critiqued? Take part in the project! 2. Original picture by Goth-Kath can be found here. Beautiful colors and details! As I said in the main critique, follow your main lightsource and don't be afraid to make high contrasts. Also mind the reflected coloured light - like here, the blue from the water reflects on her arms and nose. And one important thing - don't paint shadows with black, use other hues instead. 3. Original picture by magicwingsforever can be found here. Very interesting concept and makes me want to know the story behind! However, the background is far too dark, you should use the airial perspective by making the buildings foggy and faint. Also it would be good idea for you to reference poses, because there are a few anatomy mistakes (body & face). Give more space to the character below and make sure you compose the rest of the background in a way that will make her stop floating. Want your work to be minicritiqued? Take part in the project! Want your question to be widely answered? Just ask it! 1. First of all, your layers have to be merged and on top. If you don't want to flatten your picture, just copy all the layers and merge them with ctrl+e. This should leave an exact copy of your image as a top layer. 2. Go to Filter > Lens Correction. 4. Play with the "Chromatic aberration" sliders. Have fun with them, keeping your picture zoomed in on the left, so that you see what kind of fission you get. Then click "OK". 5. The effect will probably be too delicate, so go ahead and repeat the filter a few times by clicking ctrl+f. 6. Too messy? Don't worry, you can always mask the layer! But remember: each time you repeat the filter, it will change the virtual lense's perspective and increase the picture. Don't overdo it! And that's the end of our first A.B.C.D. issue! I hope that you enjoyed it and please tell me what you think! NOW SEND ME NEW PICTURES! And remember, if you have any questions regarding any art matter, just ask and I'll do my best to answer. If you want to have a solid guarantee of having your pictured critiqued, painted over, and to receive a video of that process with a psd file - make sure to check out the paid critique programs. Bye bye dear fellow artists and happy improving!! FIRST ISSUE OF A.B.C.D. IS OUT! CLICK HERE TO SEE IT! A. B. C. D. of digital art! During my never-ending quest of improvement I realised how essential it is to have your work reviewed and critiqued by other artists and art admirers/consumers. Good critique will point out things that you didn't notice before, comment on your methods and suggest directions that you may follow. It can help you look at your art objectively. I'm going to open Anako's Blunt Critique Department, ABCD in short. I'll be giving reviews & critiques to you works along with paintovers and redlines, answering your questions about the techniques, recording tutorial videos etc. There will be three different programs, but the main one is totally free. The whole project will be held within my dA account's journals, on my tumblr and occasionally on my youtube channel. Sounds exciting? I hope so! So what do you need to do to participate? Simply show me pictures you'd like to have critiqued and/or ask questions! The detailed information is described below. The whole ABCD project is just starting so in order to keep it alive please share a word or few about it. I want many participants, many pictures to critique and even more questions to answer! Show me your work! you can link to it here, send me a note or an e-mail to daria @ anako . pl . High resolutions prefered! Ask me questions about everything art or digital art related! Whether it's about a Photoshop technique or anatomy struggle - go ahead! ...answer and critique them with paintovers or redlines, and post them in this very journal. From time to time I'll record videotutorials on requested subjects and share my resources with you. That's the current plan! It may change and expand depending on feedback and overall reactions. A guarantee that I'll critique your chosen work. A paintover video (either private or public - you decide) with me showing you how to improve your picture. Answers to all the questions you may have when you submit picture for critique (whether they're about the picture itself or about other things). PSD file with your picture painted/drawn over. How to participate? Simply note me or e-mail me at daria @ anako . pl ! A paintover video (either private or public - you decide) with my spoken COMMENTARY telling and showing you how to improve your picture. Critique of your next picture where you'll try to improve elements discussed previously. While ABCD of Digital Art is intended mainly for digital artist (due of paintovers and technical aspects), within the free program I can also review and critique your traditional works. Subjects such as anatomy, composition, color theory etc are the same regardless the technique! Payment for paid programs is done through PayPal only. PayPal fee *is* included within the price. If you participate in the free program you don't have a guarantee that I'll choose your work for critique, but I'll look at it for sure. Not every picture is suitable for paintovers, so also keep that in mind when you choose your work - whether for free or paid program. When sending pictures for paintovers please try to provide a high resolution (not 100% high, but something reasonable) without any watermarks if possible. Edit: Thankyou thankyou thankyou I was totally stunned this morning but now I'm extremely flattered by all the kind words, favs and watches I get! thank you guys, that's so amazing! New rules, new prices, no paypal fee! It's been almost 4 years! Since I've just upgraded to 27QHD, I decided to write a full summary review of Wacom's Cintiq 13HD. HEAD OVER HERE TO READ IT! I decided to write a few words about this newest marvel of graphic tablets. Is it worth the money? Does it improve digital drawing? Let's find out. Note: if there's anything you wish to know that I didn't cover, just ask! I love Cintiq 13HD's design. Simple and pretty, definitely gives you a high quality feeling. I upgraded from old Intuos3 so there's no surprise that I'm enchanted by its looks. It resembles a bit Intuos5 I suppose, and is almost as thin. The new pen looks fancy. It has four rings in different colors to choose from, so that you can, um, "customize it". A bit useless but cool. Other than that, it's a regular Wacom pen, though a bit lighter than in previous tablets. Now the stand. It looks very... plastic and cheap - but *fortunately* you don't get to look at it much. It has three levels of support and feels rather stable, so I have nothing to complain about. It's very light and handy, and doesn't have many cables with it - so it does seem very portable, given that you buy a proper bag. I'm not sure if Wacom's bags for Intuos series are compatible, but it looks like so. 3. WHAT ABOUT THE CABLES? There's one cable with three ends (usb, hdmi and power supply) plus a surprisingly small and light power brick (or shall I say: 'bricky'). They don't provide any adapter within, so before making the purchase make sure that your graphic card has a HDMI port - or simply buy the adapter yourself, they're rather cheap. I decided to buy the most simple graphic card with full hdmi port, so that I was sure it would work with no problems! 4. SO... DOES IT WORK WITH NO PROBLEMS? I just noticed one issue - sometimes when you draw, a random stroke can appear with no sensitivity detected. It only happens once per tens of strokes, and I guess it's an easy fix with the next drivers update. 5. HOW IS THE SCREEN? AWESOME. Very bright and sharp. You can customize its temperature and slightly adjust contrast and brightness, so that's very helpful if you want it to fit your other monitors. However, I noticed one thing - not sure whether it's good or bad, but definitely worth mentioning: no matter how you adjust the settings, the darks will always be brighter than on regular screens. It might help with painting dark pictures, but the result will look different on Cintiq and on other monitors. Something to get used to I guess. 6. ISN'T 13HD TOO SMALL? Naah. Obviously it depends on your preferences, but as long as you hadn't used A3 or any bigger tablet before, the size won't bother you at all. The high resolution (1920x1080) can contain a lot of things on i. You only have to get used to the different size ratio between the monitors - something that seems small on Cintiq 13HD will in fact be much bigger on 21' monitor and in the web. 7. WHAT ABOUT THE BUTTONS? Wacom did a veeery weird thing removing all the touch strips from this series. So yeah, prepare for no finger smoothing to change your brush size or zoom in/out. Is it hard to get used to? A bit. I already had been used to using buttons for everything, since touch strips on my Intuos3 broke long time ago. So don't be discouraged, just give it some time. There are nine buttons in total: four regular, and five within a "rocker ring". But there's also a radial menu included, so you can program the infinite amount of shortcuts if you prefer. Again, something to get used to! 8. OK, NOW THE IMPORTANT PART - HOW DO DRAWING AND PAINTING FEEL? Fantastic. 8D I won't be original by saying that it literally feels as if you were drawing on paper - but hell IT DOES. Especially in Paint Tool SAI. I suddenly realised how long I hadn't drawn this way, because it feels sooo natural and awesome! Does it fasten my workflow? Well, definitely in drawing. I haven't painted for long enough yet, because I'm currently overwhelmed with drawing-only commissions. I just started a little portrait and I admit it was hard at first. I'm very used to my old settings and my old pen 'feel', so it will probably take me a while until I'm able to paint in the pace I did before. One finished picture should be enough! 9. IS THE GAP BETWEEN THE PEN AND ACTUAL CURSOR VERY HUGE? I had my biggest concerns over this matter, but once you calibrate it - in fact, you'll probably do it a few times - it becomes imperceptible. It goes a few milimeters off towards the edges, but nowhere far. From what I remember when I was testing Cintiq 21UX, they improved the technology A LOT. 10. DOES IT GET VERY HOT? 11. IS IT EASY KEEP IT CLEAN? 12. IS IT REALLY WORH THE PRICE? Well - of course it *could* be a bit cheaper, but hey, it's still FOUR TIMES (yikes!) less than for 24HD. O_o If you're a professional or pro-wannabe artist who thinks it's high time to upgrade from your regular graphic tablet - don't hesitate much. It will make your workflow a pure pleasure (once you get used to the new buttons and looking directly at the screen xD) and motivate you draw even more! at least that's what it did to me. For now, I'm definitely 100% happy with the purchase. That's all for now! I hope you enjoyed this review and will find it helpful if you hesitate whether to buy it or not. edit: Oh, and my journal skin crashed. DoD on kickstarter - WE MADE IT!! Yes guys, we made it!! With the past day we closed Days of Dawn kickstarter campaign with 108% of the goal!! Huge thanks fo everyone who supported the game and pledged even a few dollars, because each of you helped in making it into a success. Now the only thing left for me is... start working on the game! And this time it's BIG.